Spring took its sweet time in showing up this year. 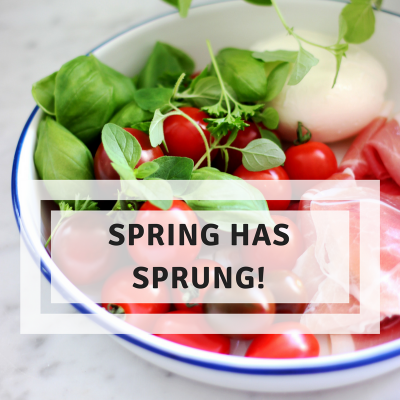 Celebrate spring’s arrival by making space for it on your plate. Why not add some fresh herbs to your dishes for a healthy dose of green, freshness and warmth? Add a little or a lot on everything! Let your passion guide you. As is true with spices, herbs are a great addition to any diet. First, by using flavourful herbs, you can significantly reduce the amount of added salt in dishes. Herbs are excellent health allies when it comes to cooking. Second, when consumed in significant amounts, their nutritional value is comparable to that of leafy green vegetables. Typically, herbs contain antioxidants, vitamin C, vitamin A and/or iron and are very low in calories. Mint and parsley are two of the most nutritious herbs, so there’s no reason to deny yourself! While you may be used to consuming herbs in small amounts to lend subtle flavours to dishes, don’t hesitate to consume them liberally, by the handful! Follow the Scandinavians’ example. Add a generous bunch of dill to your salmon before putting it in the oven or prepare a dill cucumber salad to accompany it. Freshness guaranteed! Cilantro is used extensively in Latin America, the Middle East and Asia. Let these cuisines inspire you. Why not add it to your favourite tacos and fajitas, chicken couscous or an Asian sauté! Basil and Italy are synonymous. It goes without saying that pasta and pizzas are simply divine when perfumed with this, the finest of herbs. Add a generous portion of chopped basil to homemade pizza fresh from the oven or in a pasta dish together with chicken and cherry tomatoes. Freshness to die for! When I think of mint, I think of Greece and the Greek dish tzatziki. Add a handful of chopped mint to Greek yogurt and garnish with garlic, lemon juice and grated cucumber. This yogurt-based sauce is guaranteed to brighten up any type of kebab under the sun! One of the dishes that comes to my mind to best showcase parsley is tabbouleh. Indeed, authentic tabbouleh is made mostly with chopped parsley with a bit of couscous or bulgur mixed in. Then, you can flavour the mixture with diced tomatoes, red onion and lemon juice. Enjoy freshness with every bite! Toss them in a salad! Mix some of your favourite herbs in a bowl and add a few leaves of shredded lettuce. Garnish with a mild vinaigrette so that you can enjoy the fresh herb taste fully. Whisk together olive oil, white wine vinegar, Dijon mustard and salt and pepper. There you have it! Your salad of the week will magically become a flavour high point. Herbs will instantly coax your taste buds out of hibernation!